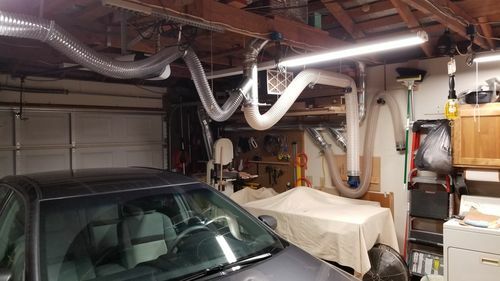 Like a lot of you guys, I share my shop with my wife’s car, the Washer, Dryer, & Water Heater. Everything is mobile, and everything get’s put away a night. Standard 2 car garage shop. Nothing fancy. Here are a few pics that would not fit in the gallery. Must have a tool shed too. Thanks for sharing your shop with us and don’t mind us. We are just jealous. Nice Shop! 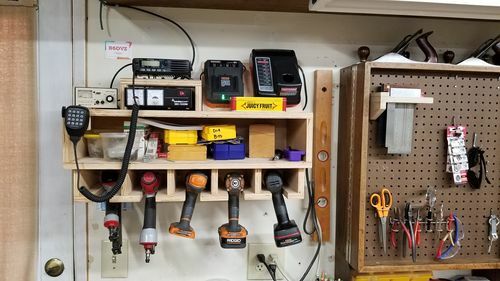 I see you have some Jet products in there and wondered how you like the bandsaw and jointer? Those items are next on my list. You have a fine shop. I have been a Jet fan for quite a while. The 6” jointer has performed flawlessly for me. An 8” would be better but bigger is always better, right? The band saw has also been a good performer. I like the newer features available currently on some of the new saws like quick release blade tension and the addition of carter guides. All in all I have been happy with all of my Jet products. The only reason I have a Powermatic saw is because that is what my local shop had in stock. He sells Jet, Powermatic, & Delta. No complaints on the Powermatic either. There has been a lot of good reports on the new Grizzly 14” band saw. You might want to check that out as well. Very nice shop and tools. You have a nice shop there as well sir! 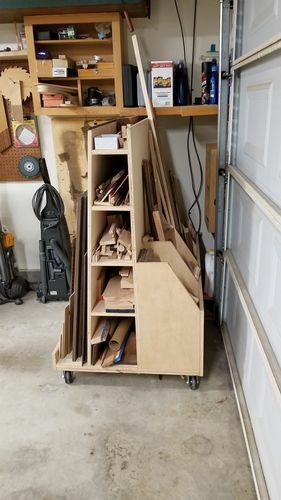 I forgot about that style of mobile base like on your workbench. I need to try that. 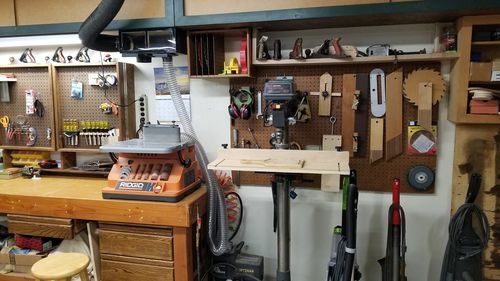 And a folding outfeed table on my tablesaw is on the to-do list as well. -- Small minds talk about people. Average minds talk about events. Great minds talk about ideas. I really like your shop. 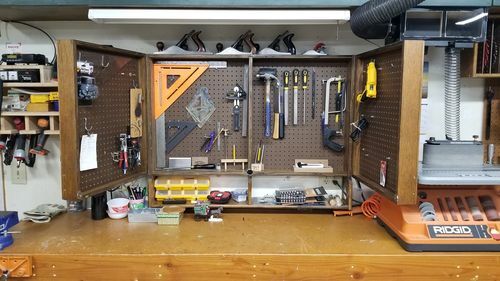 I love the workbenches you have. Did you make them? If so, what plans did you use? I see you’re a Jet fan. I still have my 24 year old Jet bandsaw. 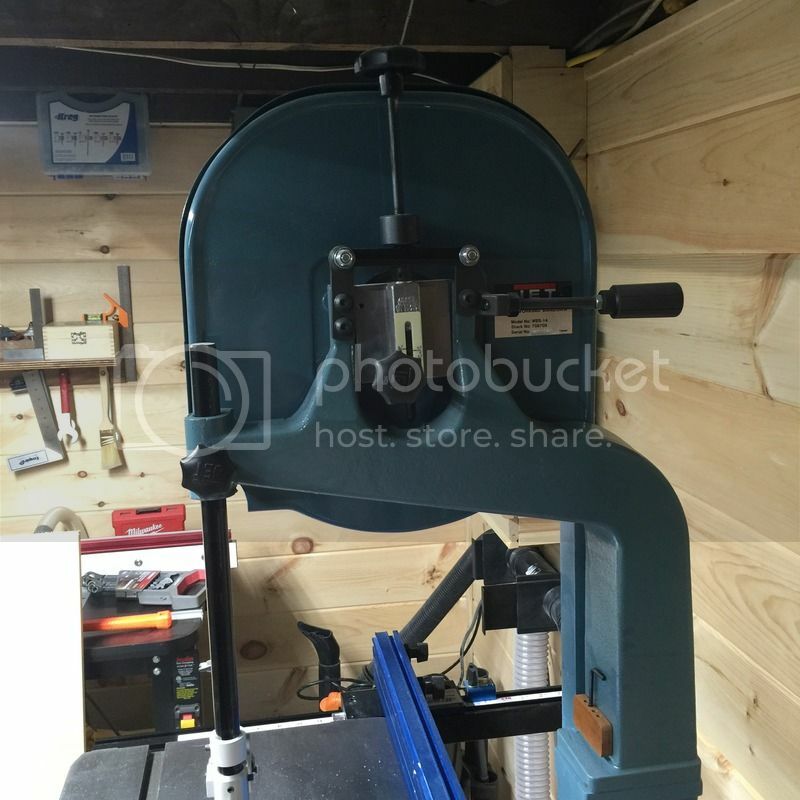 I’ve updated it with a riser block, Carter guides, Kreg fence, Tension release and just recently a 1 1/2 hp powermatic motor. She runs like new. I sold my Jet contractors table saw in February. It was 23 years old. I replaced it with a Powermatic PM1000. Love it! Looks like we have the same taste. hahaha. 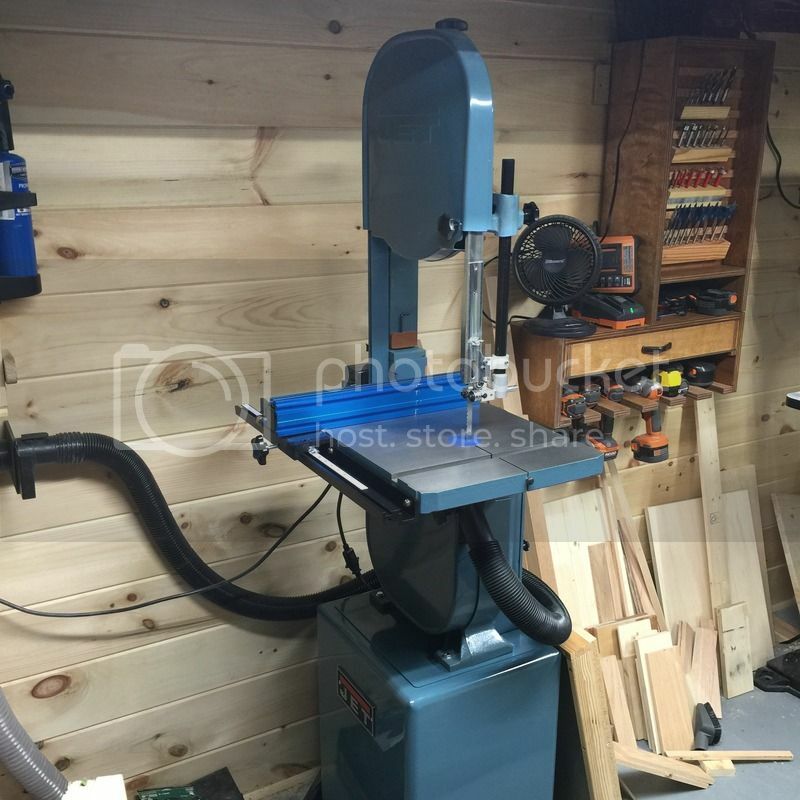 Again, great shop and nice tools! Hey Woodchuck. Thank you for the kind comments. 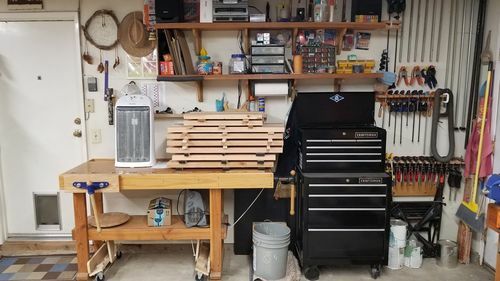 The smaller bench is one that came from The New Yankee Workshop plans. The larger bench has evolved quite a bit. It’s made from 2×6’s and has a double layer of 3/4 particle board for it’s top. It originally fold up against the wall and only had two legs. It now has 4×4 legs and a shelf added. It’s kind of a Frankenstein bench! :) It weighs a ton too! Most of my tools came from Ideal Saw Works in Fresno. 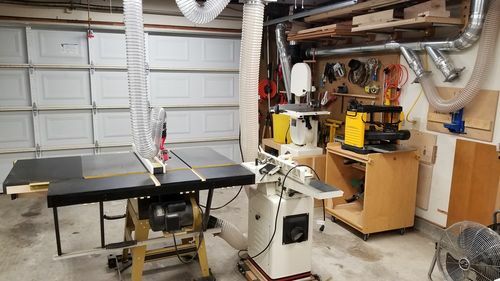 Jet/Powermatic is what they recommended and they have served me well for many years. 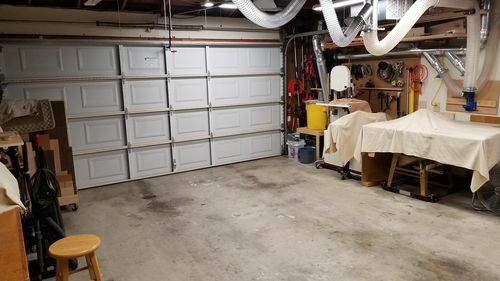 I’m in the process of convincing the wife that I need the garage permanently for a shop. Right now I have to put everything away each night so her car can sleep here. Bummer! I really like the walls of your shop. It reminds me of my 7th grade woodshop class.